Author: Paul S. Collignon, J.D. This treatise is dedicated to the multitude of pro life advocates who have worked unceasingly to stop the senseless killing of little persons in their mothers’ wombs. The pro lifers’ work has been mammoth but with little results because their main attack has been based on morality. As a whole, the 21st century morals of our country are lower than a hernia on a bull fighter. 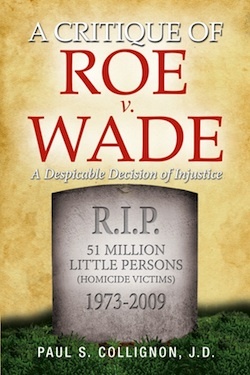 Roe v. Wade will never be reversed for the reason that the killing of a little person is immoral but it will be reversed because it is a legal hoax perpetrated by Harry Blackmun who wrote an iniquitous majority opinion.